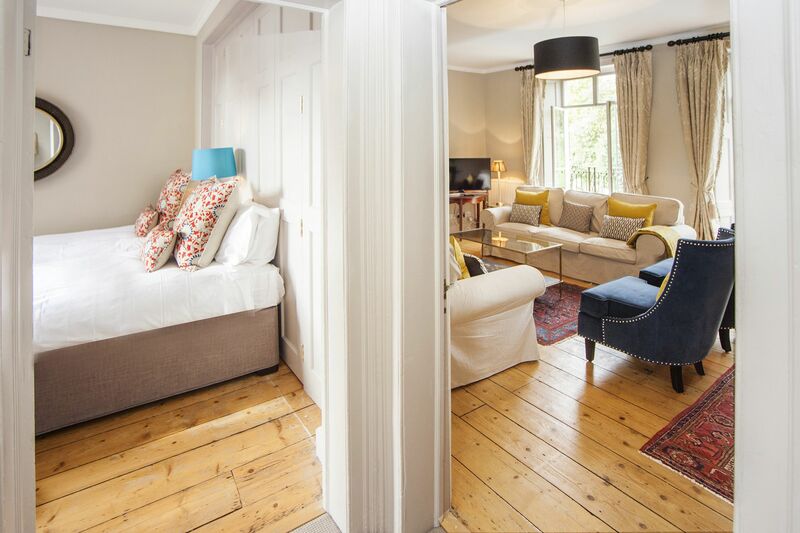 Get together in style at this inviting Georgian townhouse for 8 in central Bath. This lovely large home spread over 3 floors has welcoming rooms for everyone, including 4 double bedrooms and 3 bathrooms. 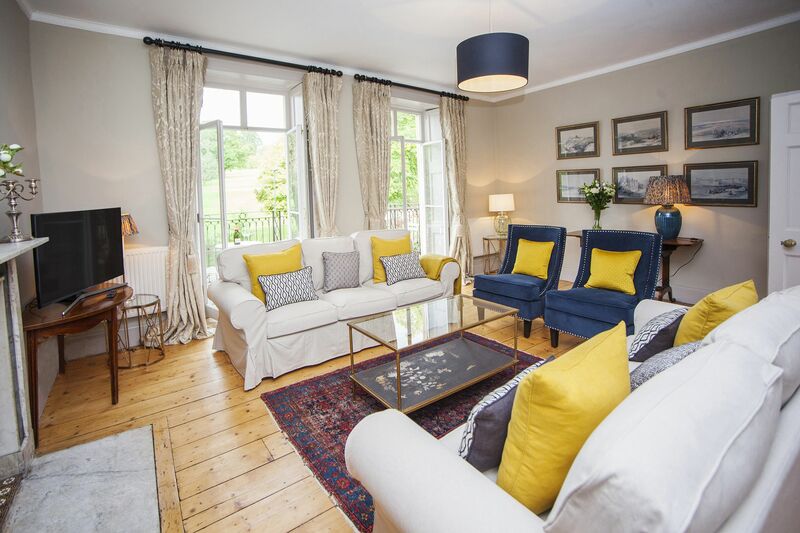 You can all converge in a spacious and glamorous living room with a west-facing balcony and lovely green vistas, where you’ll be sure to raise a celebratory glass or two. 4 Double bedrooms. 3 of the 4 bedrooms have zip and link beds so they can be made up as two 3’ singles or a superking 6’ bed. The 4th bedroom has a 5’ king size bed. 3 Bathrooms. 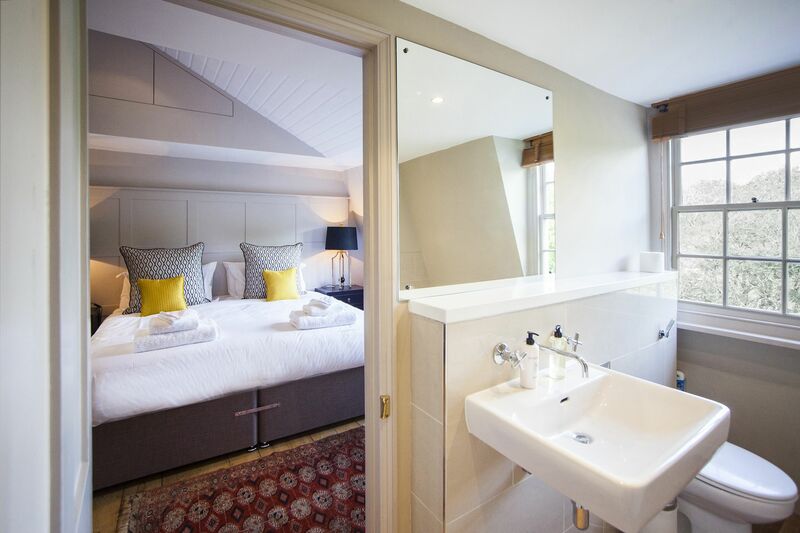 One large en-suite with bath and separate shower, connected to the principle room, and two further shower rooms. Living space. Spacious with seating for up to 8. TV with Netflix. Wi Fi. Amazon echo music streaming. Outdoor space. A linear west facing balcony with 2 outdoor cafe tables and seating for 4. Location. 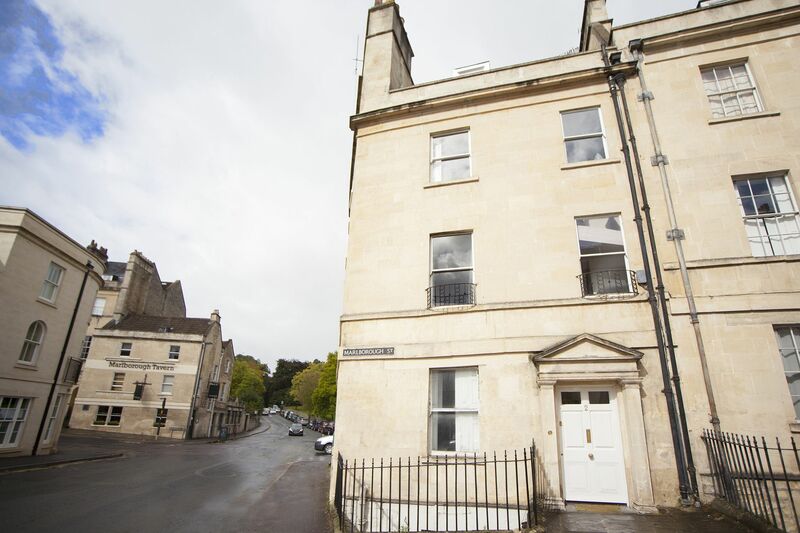 Situated behind the famous Royal Crescent, 10 minute walk to the city centre. 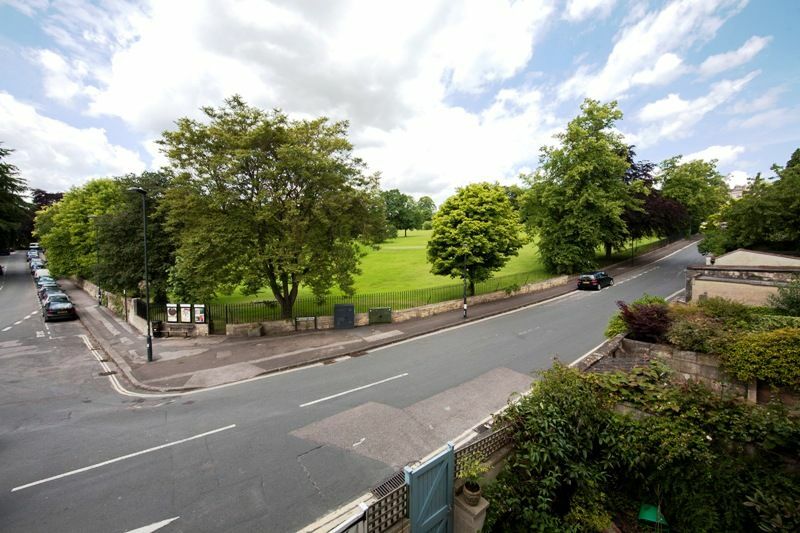 Close to local shops and Victoria park with children’s outdoor play area, miniature golf, bbq pits, botanical gardens and tennis courts. Next to a great local gastropub for lunch and dinner with inside and outside seating and an18 hole golf course with great city views. 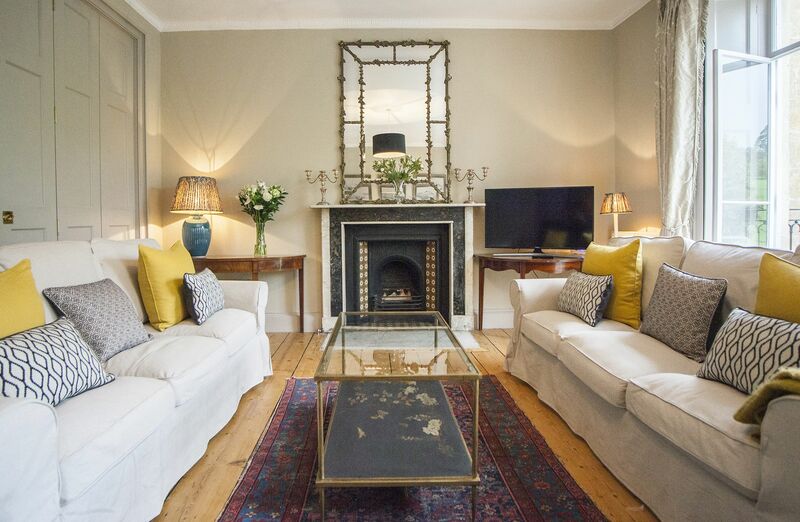 This appealing Georgian townhouse has wonderful original features, including handsome decorative fireplaces in all rooms, high ceilings, and large sash windows with original shutters. 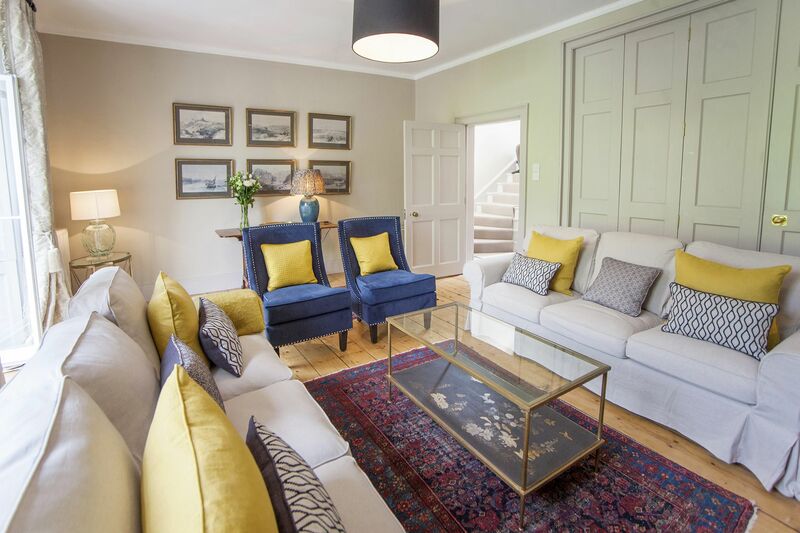 The décor mixes traditional charm with contemporary flair throughout, and features original stripped wood floors and antique furniture, alongside rich warm furnishings and gleaming accessories. 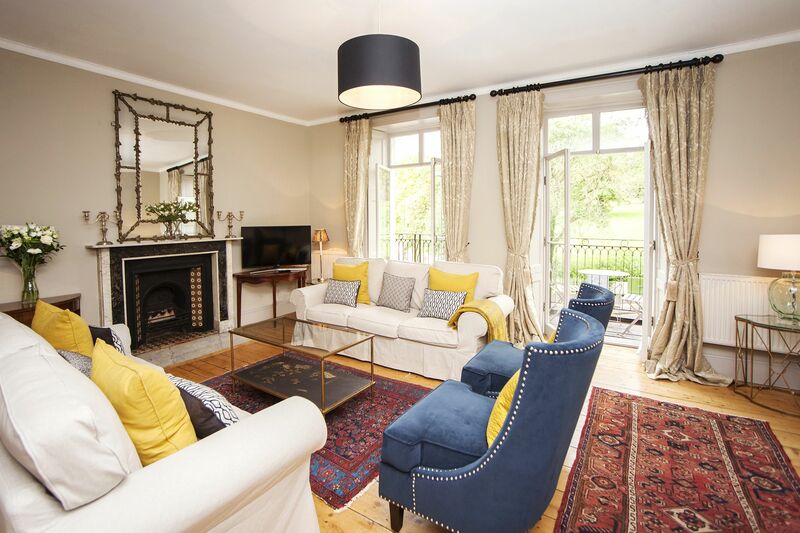 The glamorous living room has a large black and gold marble decorative fireplace with a striking gold mirror above. There are two generous sofas to seat 6, and a couple of smart easy chairs. On a console is a large TV with Netflix, WiFi and an Amazon Echo radio, bluetooth and music streaming. 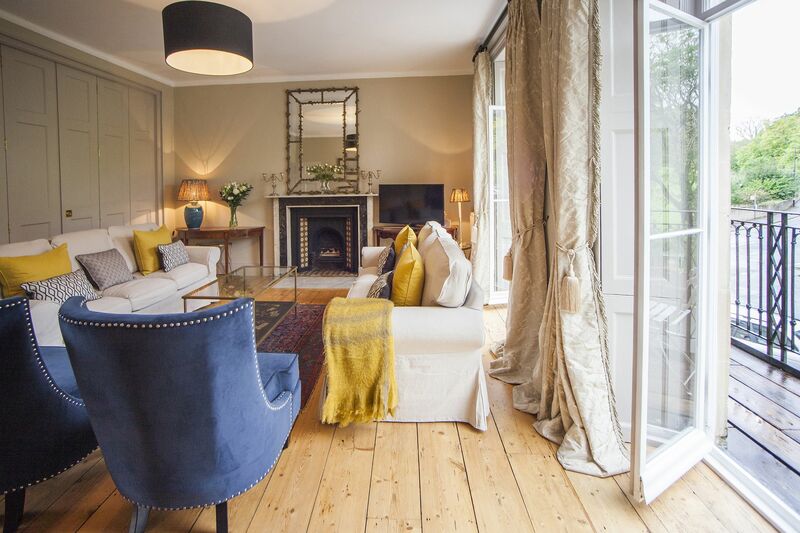 Light floods in from 2 sets of floor-to-ceiling French doors, leading onto a long wrought iron balcony with lovely green vistas. 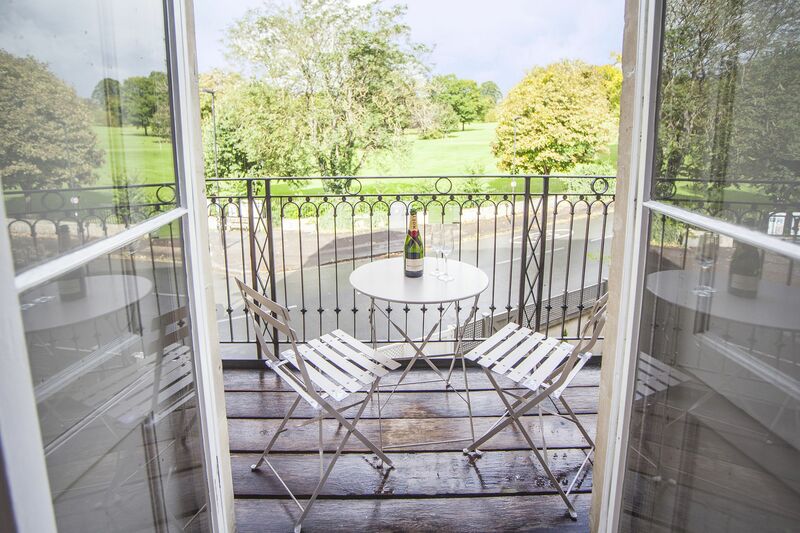 A couple of café tables and 4 outdoor chairs invite you to linger with a drink and take in the views of the golf course opposite and Victoria Park. 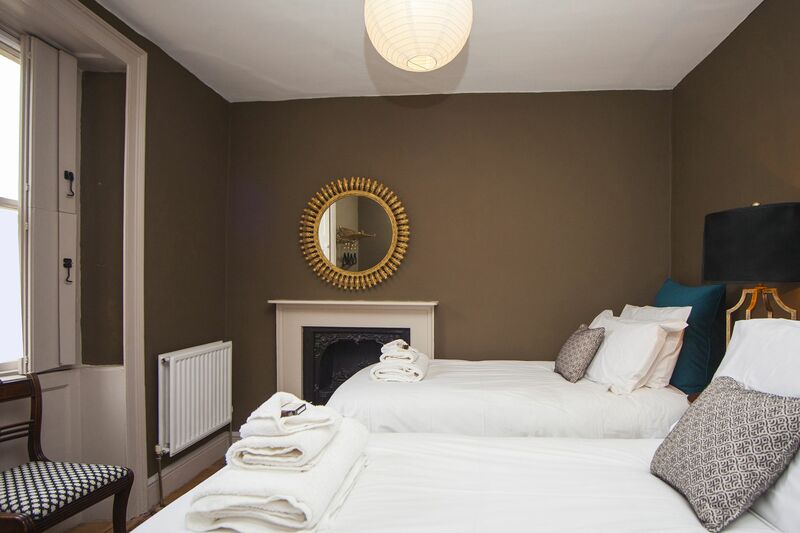 At this level is a pretty double bedroom in velvety taupe and turquoise with two 3’ beds that zip and link to become a 6’ double. 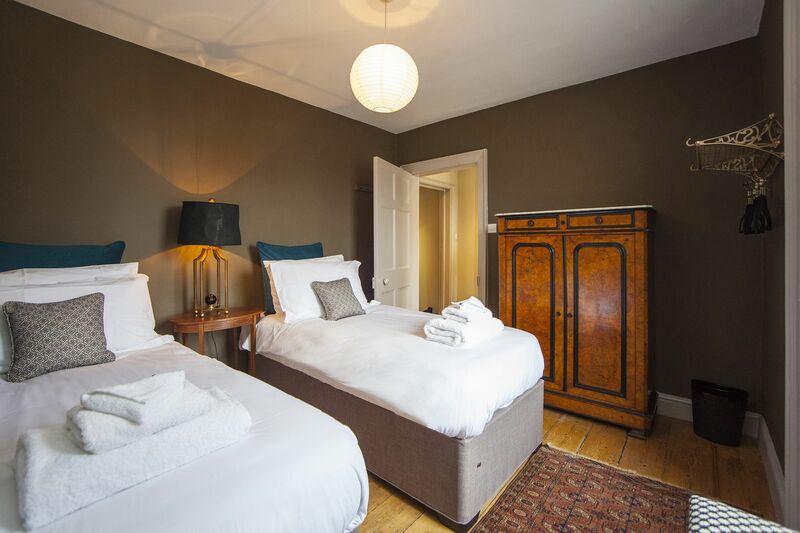 There is a large antique chest of drawers and an alcove cupboard with hanging space and storage shelf over. 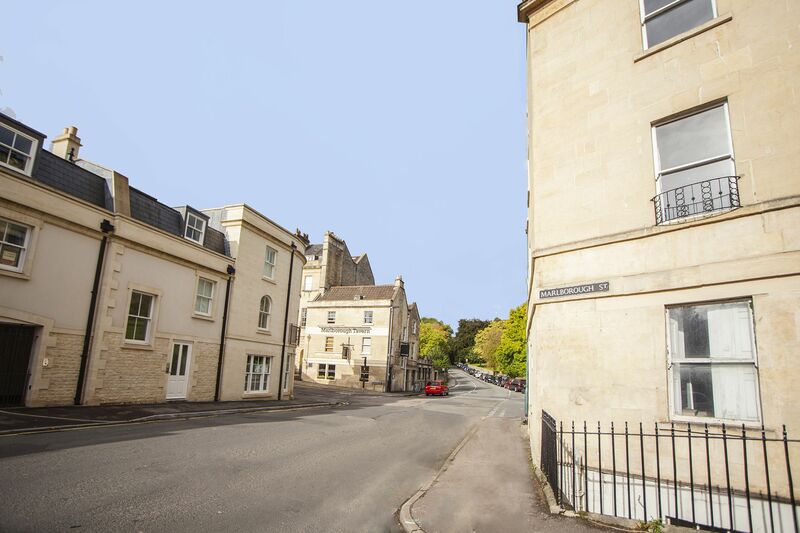 The views along the road show the back of The Royal Crescent and quirky mews houses that were originally stabling. 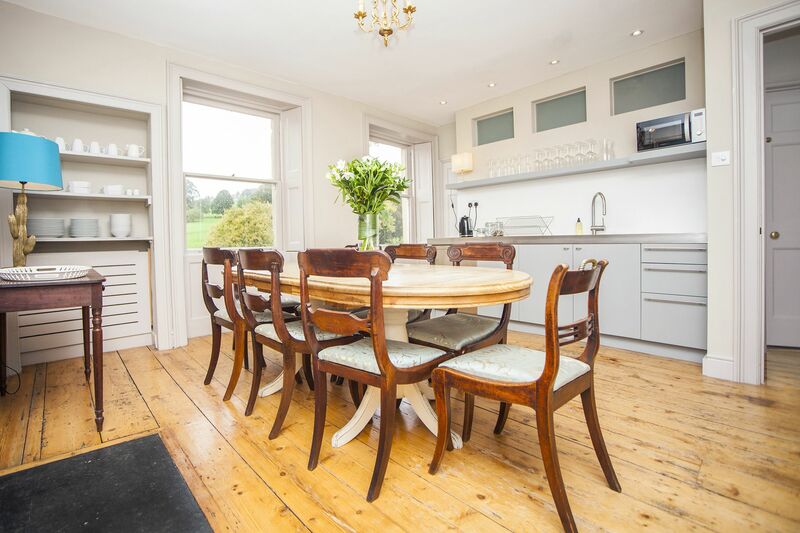 The sunny informal kitchen has great views through the trees onto the golf course. 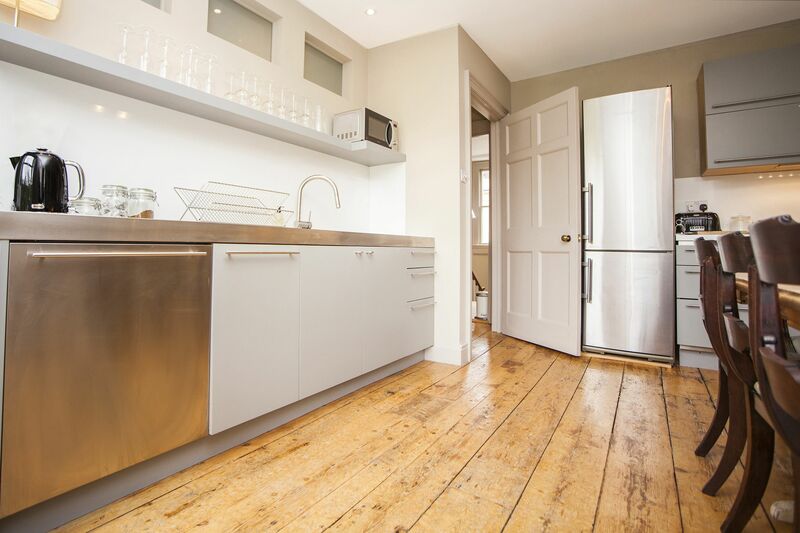 There is an array of grey, white and stainless steel fitted kitchen units with glasses and crockery to hand in open shelving. In front of a large ornate decorative fireplace, is an antique oval dining table and 8 upholstered chairs. 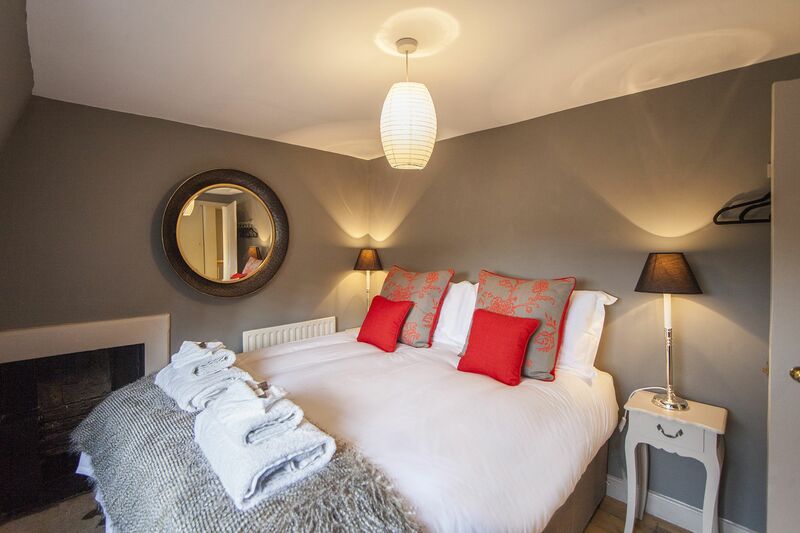 Facilities include a large 4 ring induction hob, an electric oven, microwave, large fridge and separate freezer, a dishwasher and a generous supply of cookware and storage. An alcove cupboard has further utility items. 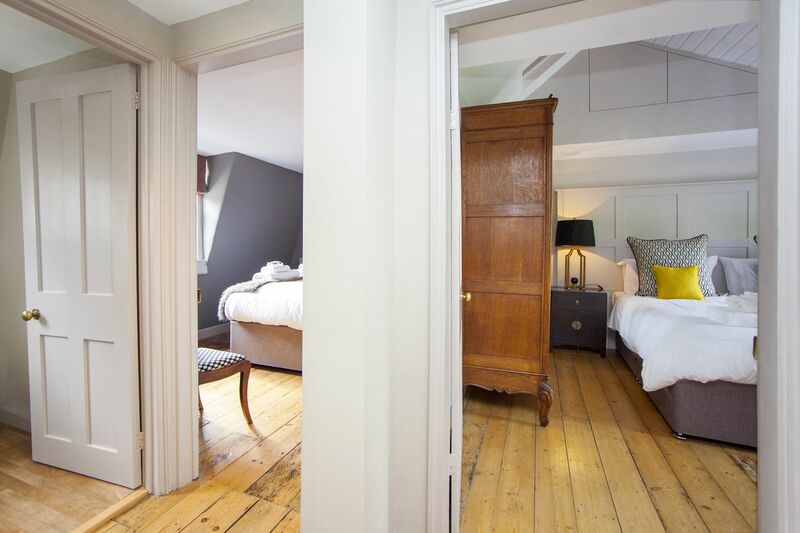 On this floor is a handsome double bedroom in rich taupe and gold with two 3’ beds that zip and link to become a 6’ double. There is a large antique armoire with shelves, a brass hanging rack for clothing and an occasional chair. 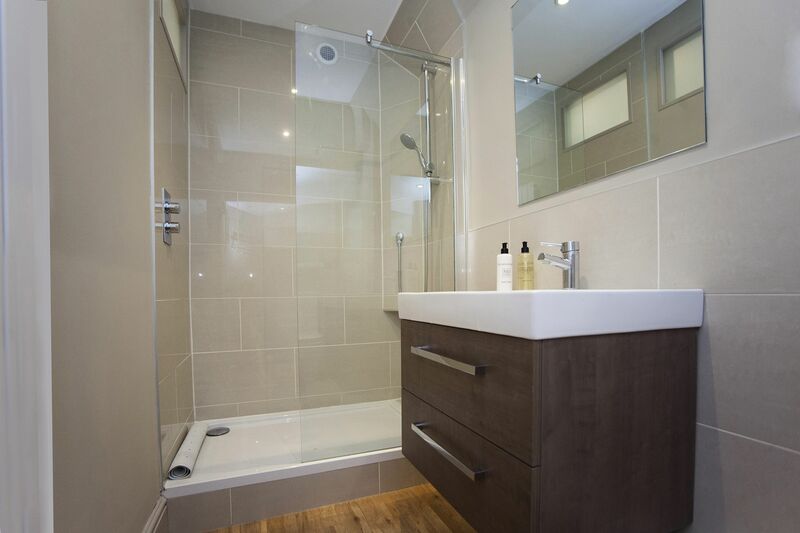 A spacious contemporary shower room in taupe, has a large shower, handbasin with storage under and a WC. and has a 6’ double bed with zip and links to covert to two single 3’ beds. 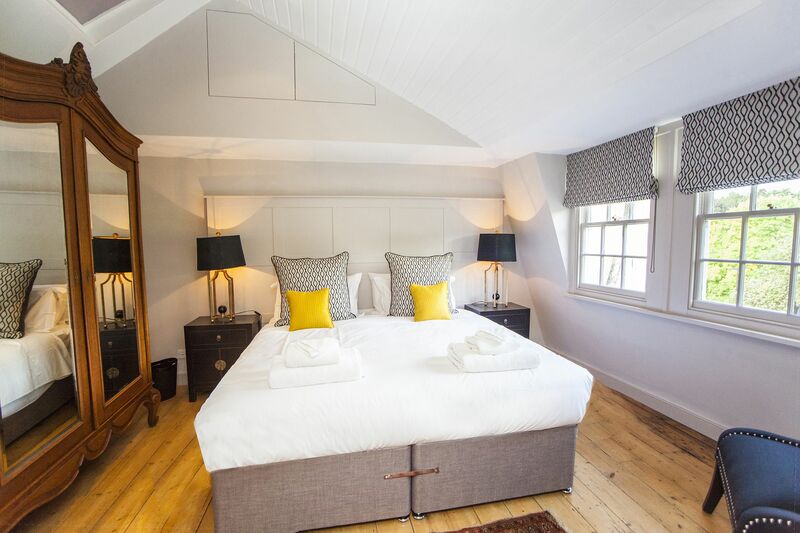 There is an elegant antique mirrored wardrobe and large bedside cabinets provide additional storage. 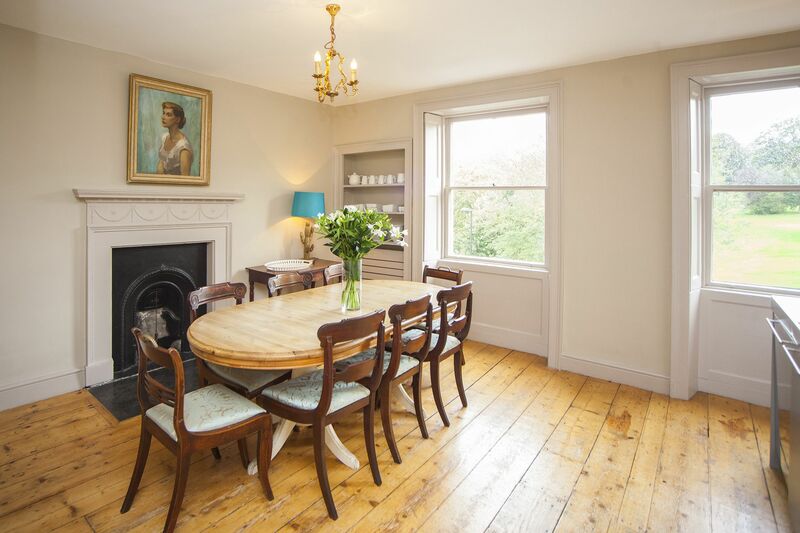 Under the sash windows with lovely green vistas is a smartly tailored easy chair. 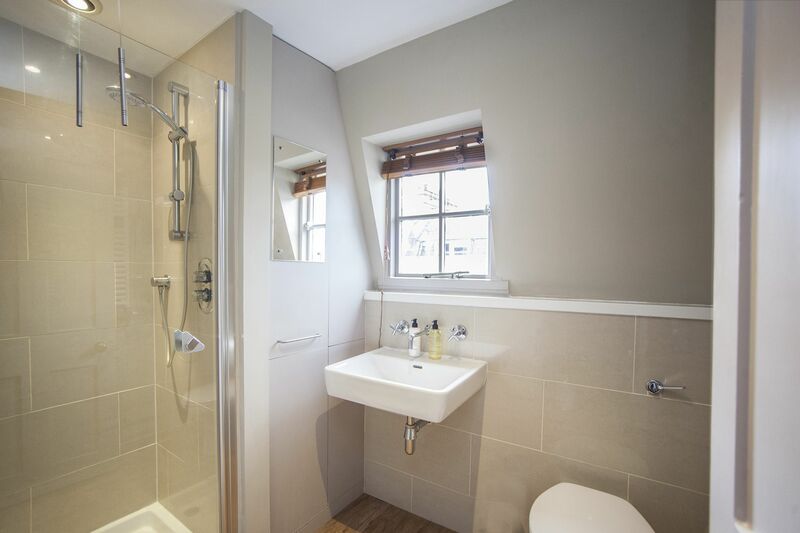 This bedroom has a spacious contemporary en-suite bathroom, seamlessly tiled and painted in taupe, with a bath, large shower, hand-basin and WC with shelf over for toiletries. 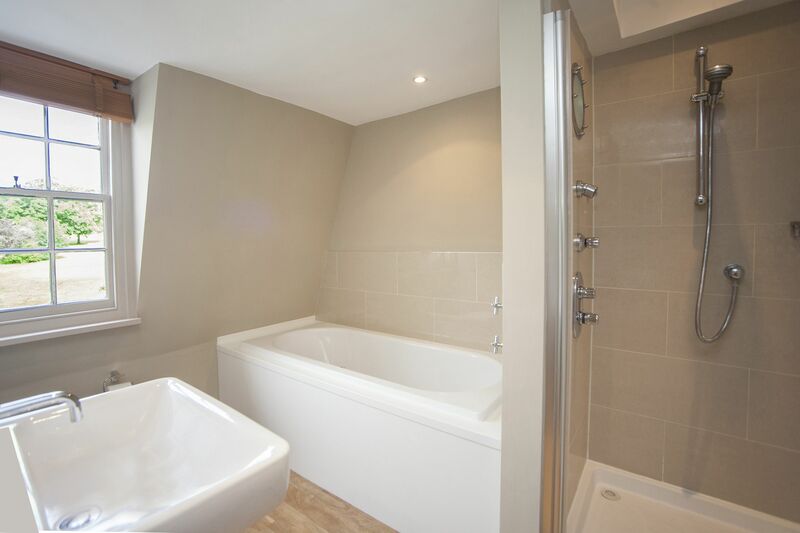 The contemporary shower room has a small shower, hand basin and WC. In a separate over-stairs cupboard is a combination washing machine and dryer. 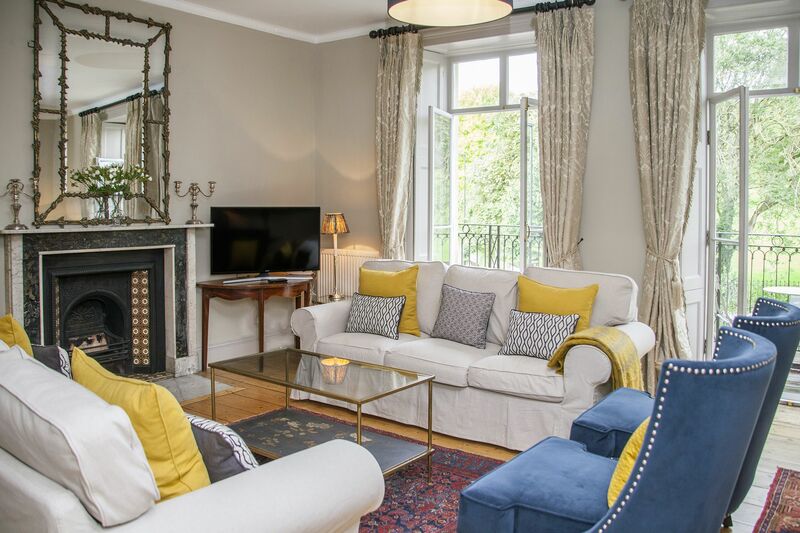 The House is located behind the world renowned Royal Crescent and close to St. James Street where you will find an Italian delicatessen/ coffee shop, newsagents, pub, florists, organic green-grocers and a few hair dressers. 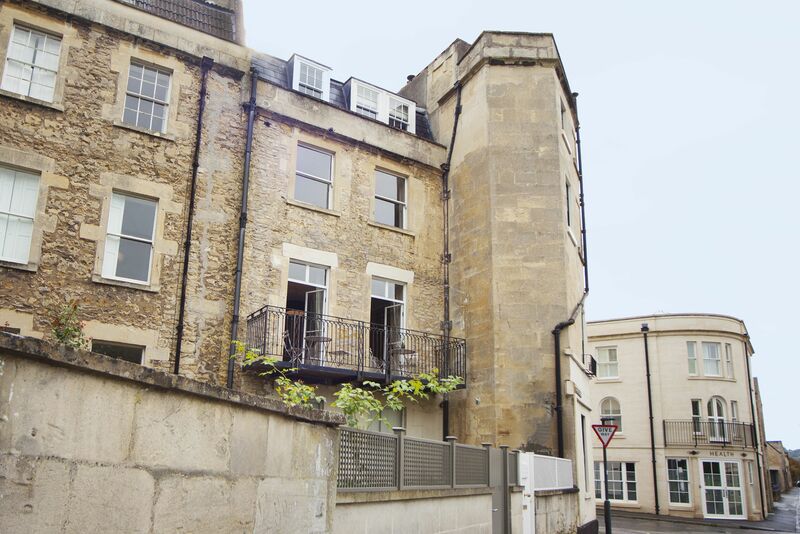 It is about a 10-15 minute stroll to the high street either past some of Bath's most stunning architecture or through Victoria Park. The city centre has a wealth of shops, restaurants, cafes, museums, theatres, and the Thermae Spa for you to explore. The Marlborough Tavern gastro pub is adjacent and serves fabulous food with a large outdoor terrace for when the sun shines. Victoria Park is just down the street with botanical gardens, award winning play centre, indoor/outdoor tennis courts, hot air ballooning, miniature golf and much more. 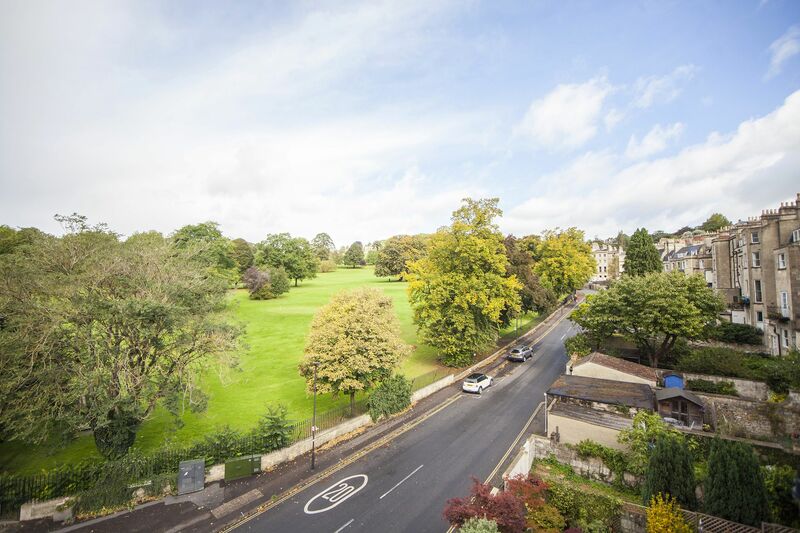 The Approach 18 hole golf course is across the road and has wonderful views of Bath and the surrounding hills. Marlborough House was fantastic. It had everything we needed for a lovely weekend in Bath and Sara could not have been more helpful. We had a wonderfully memorable stay in Marlborough House. Being a fan of Jane Austen, from my teenage years, I was in my element staying here for my 60th Birthday Celebration with my husband and the family, including our baby grandson. 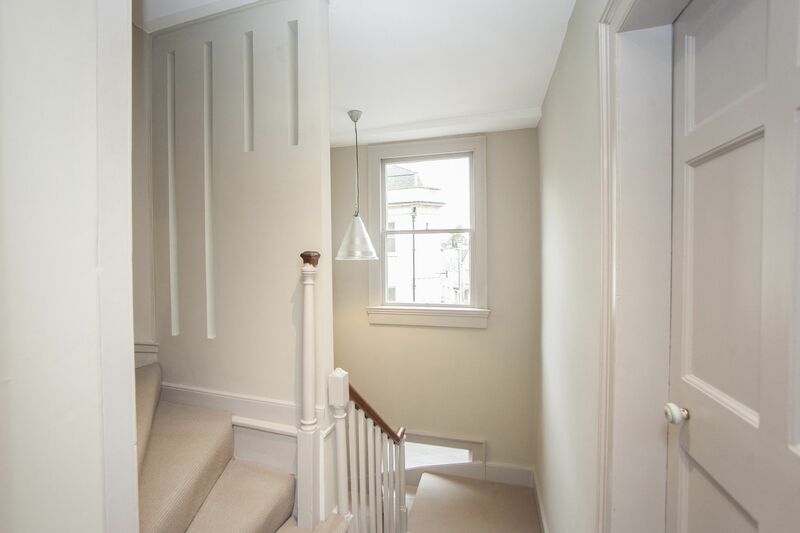 It is a very well-positioned and elegant house, with a wonderful Regency ambience, not so evident just from the outside. Also, a real bonus is the practical and stylish household resources, including the 21st Century, Alexa system. 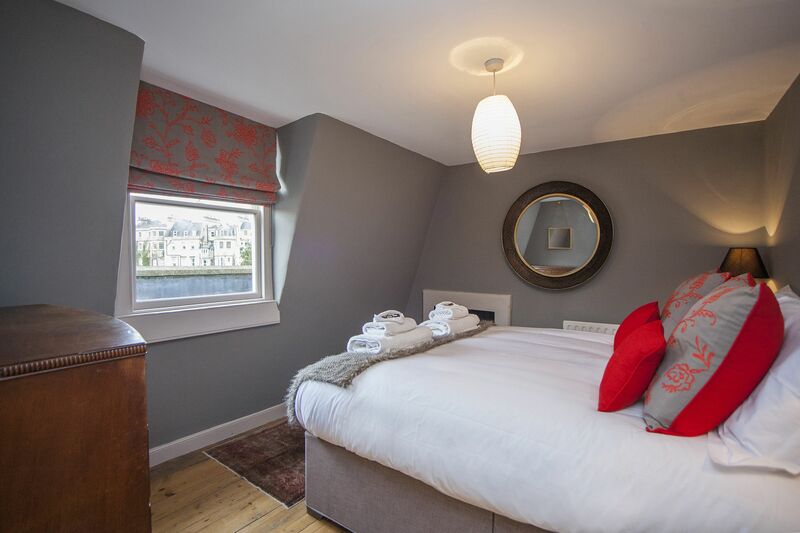 We will definitely be checking Bath Rental Properties for future stays. 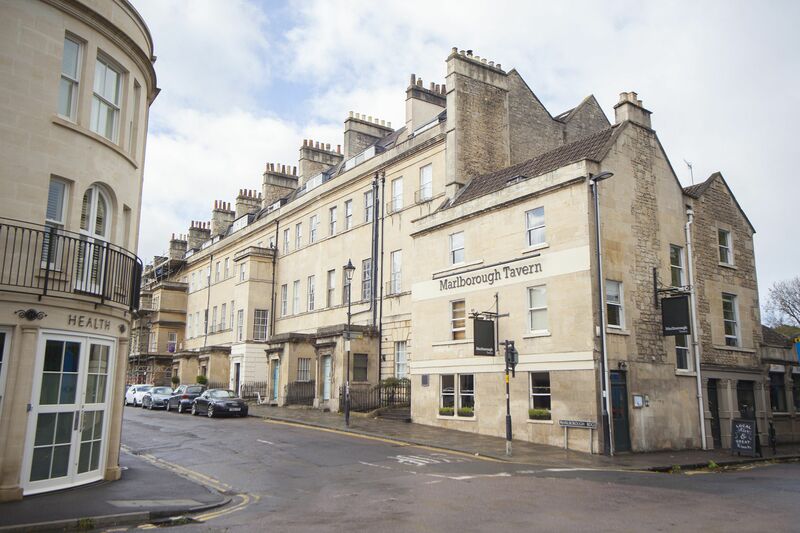 Our stay at the Marlborough Street house in Bath was awesome! There were 4 couples sharing the house and it was the perfect amount of space for our needs! Great location...walk-able to mostly everything (although it is uphill on the way back), and having the tavern just across the way made it extra convenient! Sara was so helpful with everything! Would definitely recommend this place! 5 stars. Great apartment in a perfect location. Very comfortable with a well equipped kitchen. Everything was clean and working. 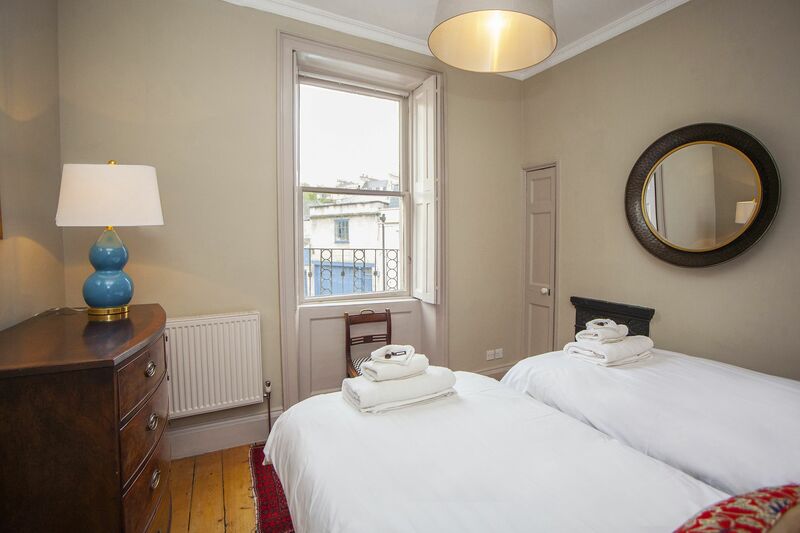 The apartment is close to the Royal Crescent and only a short walk from the city centre. It's near a nice park too. Just wanted to say how much we enjoyed our stay in Marlborough St this July. The house was lovely and in an ideal location. The attention to detail was very impressive especially the provisions left for our arrival. On a practical level the kitchen was well equipped and the residents parking permit worked well. Nearby shops were handy for provisions and the Marlborough Tavern an easy option for a good pub meal. 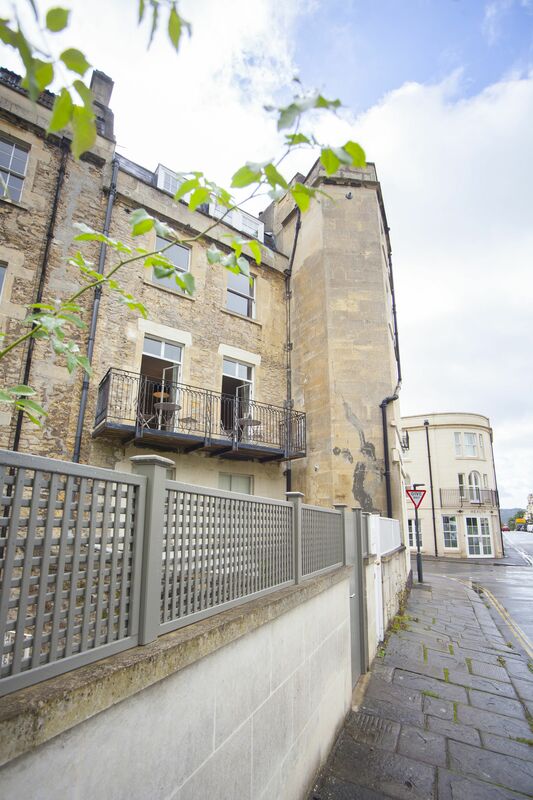 We would highly recommend this property and the service we received from the staff at Bath holiday rentals. 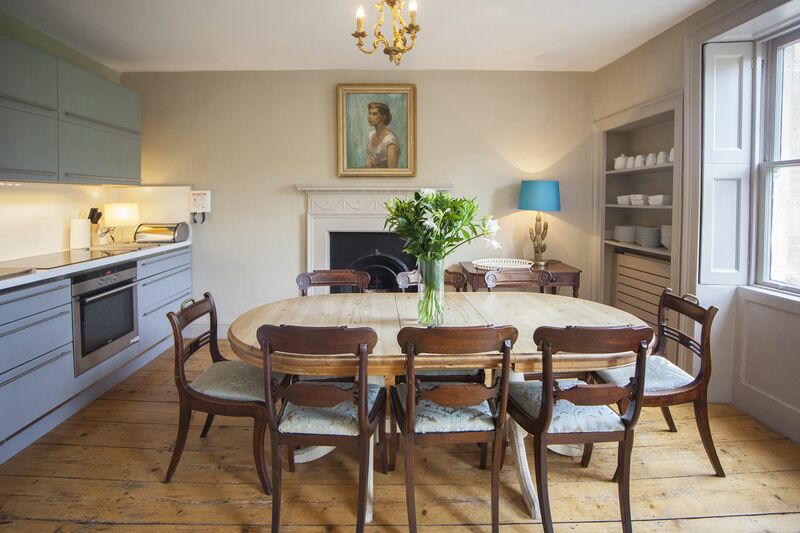 The property has charm and character. It’s in a nice location across from the golf course and park and has some conveniences close by. We enjoyed the large windows and sunlight in the lounge. We found the property manager extremely helpful and pleasant to work with. This is a great house, with titled floors and plenty of stairs to run up and down :-). The kitchen has a perfect size and all the amenities we needed, the living room was perfect for a chat and a drink between activities. The Coop is just up the street and has all you need for breakfast. Friendly atmosphere and perfect walking distance from the town center. We had one dinner in the pub just across the street, very good food! We also drove to Wells on Saturday, recommend the trip, very nice town (smallest in England 12000 inhabitants), a nice market on Saturday. Lovely stay and very accommodating. Great place. Would recommend. This Property is new as of September 2017. 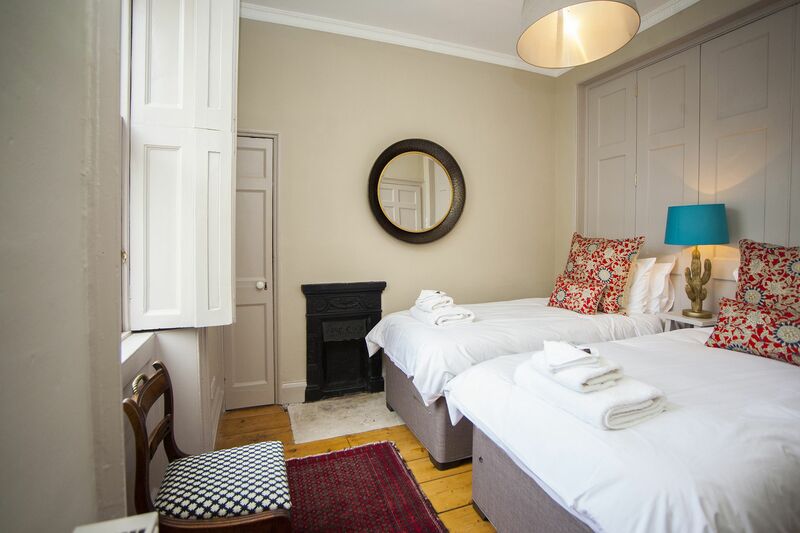 We would really appreciate you giving a testimonial if you have stayed in the Marlborough Street House.